Two recent texts—Our Children and Other Animals and Childhood and Pethood—offer new insights on the question of children and animals in society, culture, and literature. As my discussion below suggests, Childhood and Pethood expands on the social theoretical foundation established in Our Children and Other Animals. In Our Children and Other Animals, Cole and Stewart argue that children and animals occupy a shared position of oppression in human societies. Children and animals are widely treated as similar to but not quite human—a norm that is reinforced by cultural and legal practices throughout the world. Cole and Stewart show how human children gradually learn to instrumentalize the animal other as they grow up: indeed, subjugating the animal other, the authors suggest, is the key mechanism by which not-quite-human children become fully human and adult. Cole and Stewart examine how powerful institutions, including education and the media, introduce and reinforce the child’s process of learning to objectify animals. Movies, video games, and schools present animals as cute but ultimately disposable: animals’ value lies in their usefulness (in narrative, in meat, etc. ), not in their subjectivity. 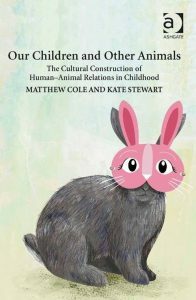 Cole and Stewart conclude their book by showing how recent vegan children’s books offer a counter narrative to the dominant practices of animal subjugation in human societies and in human cultural production, thus providing an alternative model for human-animal relations for both children and adults. Childhood and Pethood is (to my knowledge) the first collection of scholarly essays that theorizes the relationship between children and animals in culture and literature. The book opens with two brief and thought provoking prefaces, one by Monica Flegel, the other by Kenneth Kidd. Flegel suggests that childhood and pethood acquired a similar status in the 19th century, as children and animals came to be seen as “sentimental investments.” Though Flegel’s position aligns with that of Cole and Stewart in that she acknowledges children and animals share a subjugated social position, she pushes this line of thinking by asking whether “dependency” (a state that describes both children and pets) must necessarily “[entail] a lesser status” (xvii). Kidd points out that while childhood studies and related fields have promoted children’s agency, they have largely done so in a tradition of humanism—and “human exceptionalism”—to the detriment of nonhuman animals. In their introduction to the text, Anna Feuerstein and Carmen Nolte-Odhiambo suggest the shared status of children and pets can be a source of creative and political potential: “The ways in which children and pets interact with each other provide productive avenues for exploring not only interspecies kinship relations but also how disenfranchised subjects can negotiate their marginalization, create new affective economies, and engage in unexpected forms of growth” (2). Matthew Cole, and Kate Stewart. Our Children and Other Animals: The Cultural Construction of Human-Animal Relations in Childhood. Taylor and Francis, 2014. Anna Feuerstein, and Carmen Nolte-Odhiambo. 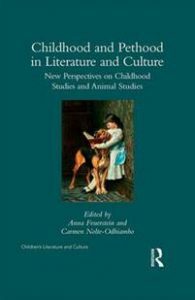 Childhood and Pethood in Literature and Culture: New Perspectives in Childhood Studies and Animal Studies. Taylor and Francis, 2017.